Cysts in the kidney are among the most common inherited human pathologies, and recent research has uncovered that a defect in cilia-mediated signaling activity is a key factor that leads to cyst formation. The cilium is a microtubule-based organelle that is found on most cells in the mammalian body. Multiple proteins whose functions are disrupted in cystic diseases have now been localized to the cilium or at the basal body at the base of the cilium. Current data indicate that the cilium can function as a mechanosensor to detect fluid flow through the lumen of renal tubules. Flow-mediated deflection of the cilia axoneme induces an increase in intracellular calcium and alters gene expression. Alternatively, a recent finding has revealed that the intraflagellar transport 88/polaris protein, which is required for cilia assembly, has an additional role in regulating cell-cycle progression independent of its function in ciliogenesis. Further research directed at understanding the relationship between the cilium, cell-cycle, and cilia-mediated mechanosensation and signaling activity will hopefully provide important insights into the mechanisms of renal cyst pathogenesis and lead to better approaches for therapeutic intervention. The formation of renal cysts is common to a number of human syndromes, including polycystic kidney disease (PKD), Bardet-Biedl syndrome (BBS), Meckel syndrome, and nephronophthisis (NPHP) (1). Most prevalent among these disorders is PKD, which can be inherited as a recessive (ARPKD) or dominant trait (ADPKD). In general, the pathogenesis of these disorders has been well defined; however, the cellular and molecular processes that underlie cyst formation and expansion are not understood (2). Through advances in genomics and computational biology and through research in model organisms, many genes that are associated with cystic kidney disease syndromes have been identified. Somewhat surprising, the unifying theme that has emerged is that many of the proteins that are involved in cystic diseases localize to the cilium or to the basal body at the base of cilia (3,4) (reviewed in references [2,5–7]). The cilium is a microtubule-based organelle that first was identified more than a century ago (8); however, until recently, it has suffered from a severe lack of respect. Mutations that impair cilia formation or its signaling activity have recently been shown to have severe consequences for development and for postnatal tissue physiology (2,9). For example, during development, cilia are required for proper left–right axis specification, neural tubule closure and patterning, and proper formation of the limbs and long bone (10–13). In addition, cilia signaling defects in postnatal life cause cystic lesions in the liver, pancreas, and kidney and result in hydrocephalus, and they have been associated with mental impairment, obesity, and diabetes (reviewed in reference ). Cilia extend from the surface of many eukaryotic cells and can be either motile or immotile, the latter being referred to as primary cilia. In mammals, motile cilia are normally found in large groups on the apical surface of epithelial cells, such as those that line the trachea or that are on ependymal cells of the brain ventricles (Figure 1A). The role of these cilia in processes such as mucous clearance and cerebrospinal fluid movement is well documented. In contrast, the importance of the primary cilium, which is found as a solitary structure, has gone unnoticed despite its presence on nearly every cell in the mammalian body (Figure 1B). The primary cilium comes in a variety of forms that have been modified to respond to a cadre of stimuli. These diverse forms are found on cells of the olfactory epithelium; on rods and cones in the retina, on cells of the renal tubule; and on mesenchyme, fibroblasts, and neurons. Recent research has discovered that primary cilia are far from being a vestigial organelle as once proposed; rather, they function as critical components of signaling pathways that are involved in chemo-, photo-, and mechanosensation that allow a cell or an organism to interact with and respond efficiently to its environment. For example, it is now known that cilia are required for normal responses to hedgehog (Shh and Ihh) and PDGF-A (13–16). In part, this is due to the localization of transcription factors, kinases, or receptors that are involved in these pathways in the cilium axoneme. Understanding the multiple functions of cilia will provide important insights into a number of disease states and developmental defects that are associated with abnormal regulation of these pathways. (A) Scanning electron micrograph of motile cilia located on the ependymal cells that line the brain ventricles. Insert shows higher magnification of motile cilia. (B) Immunofluorescence micrograph of primary cilia (green) located on isolated renal tubule. Nuclei are shown in blue. Insert is a scanning electron micrograph looking into a renal tubule. (C) Architecture of cilia (primary and motile) and the basal body. (D) Intraflagellar flagella (ciliary) transport along the axoneme. Anterograde movement of the intraflagellar transport (IFT) particle is mediated by a heterotrimeric kinesin (kinesin-1) complex, whereas retrograde transport is mediated by a cytoplasmic dynein. Cilia are complex structures and are devoid of ribosomes. The cell must transport proteins that are required for cilia assembly, sensory perception, and signaling into the cilium, where they become integrated into the axoneme. 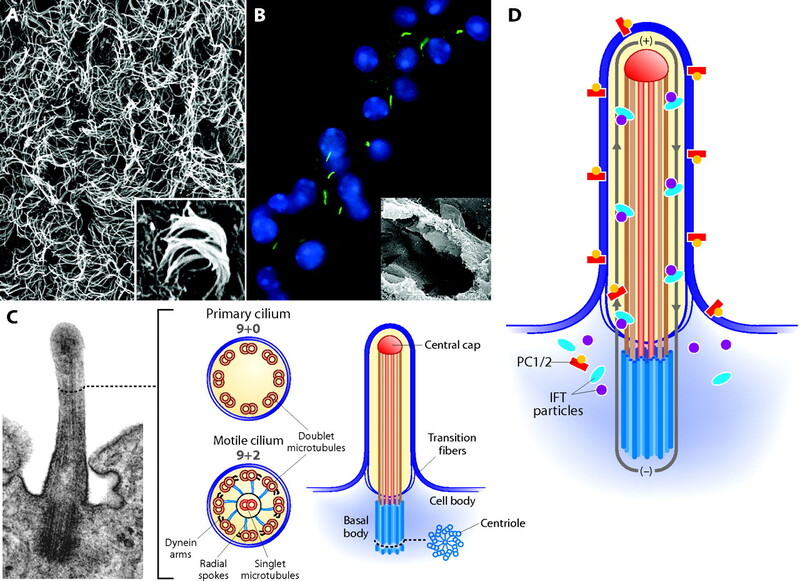 This movement of proteins along the cilia axoneme occurs through a microtubule-based conveying system called intraflagellar transport (IFT; Figure 1D) (17) (reviewed in reference ). IFT was first identified in Chlamydomonas and was subsequently found to be conserved in other ciliated eukaryotes (17,19,20). The proteins that are involved in cilia formation concentrate around the basal bodies, where they assemble into complexes called IFT particles. These particles are transported up the cilium by a heterotrimeric kinesin (kinesin-II complex: Kif3a, Kif3b, and KAP) (17). Retrograde transport back to the basal body is mediated by a cytoplasmic dynein motor protein. One function of the IFT particle is to carry cargo, such as receptors and channels, and structural proteins into the cilia axoneme, as well as to deliver signals that emanate from the cilia into the cytoplasm in response to external environmental stimuli (21) (reviewed in reference ). This was recently demonstrated in the case of the transient receptor potential vanilloid channels OSM-9 and OCR-2 in the cilia of sensory neurons in C. elegans. By contrast, IFT did not seem to be involved in movement of PKD-2 in these cilia (23). The cilium is assembled during interphase of the cell cycle and originates from the basal body. The basal body is composed of nine triplet microtubules that are assembled into an elaborate barrel-like structure (Figure 1C) (24). The basal body is also known as the centriole that when surrounded by a dense matrix, called the pericentriolar material, forms the centrosome and functions as a microtubule organizing center during mitotic division. This close association between the cilia and the centrosome has led to the speculation that the cilium has a role in regulating the cell cycle. In other words, as long as the cell has a cilium, it is unable to proceed through mitosis until the cilium is resorbed, freeing up the centrioles for cell division. This is supported by the recent association of cilia proteins with cancer and by the proliferative phenotype seen in cystic kidney diseases that result from disruption of several cilia-localized proteins (25–29). Alternatively, recent data have raised the possibility that the IFT proteins play a more direct role in regulating proliferation independent of the cilium. Studies by Robert et al. (30) have demonstrated that the IFT protein IFT-88/polaris localizes to the centrioles throughout the cell cycle and that small interfering RNA–mediated knockdown of IFT-88/polaris promotes cell-cycle progression to the S and G2/M phases with an increase in proliferation. In contrast, overexpression of IFT88/polaris was found to interfere with G1-S transition, leading to apoptotic cell death. Their data further revealed that IFT-88/polaris bound to Che-1, an Rb-interacting protein that inhibits the growth-suppressing function of Rb. Defining how the IFT proteins are involved in cell-cycle regulation and the connection with cilia will hopefully result in a better understanding of the molecular mechanism that drives the proliferative phenotype in diseases such as these renal cystic disorders. At the distal end of the basal body just before the start of the cilia axoneme are the terminal plate and transition fibers (Figure 1C) (24,31) (reviewed in reference ). Although little is known about the composition of these structures, they are thought to function as a gatekeeper to regulate protein entry into the cilium. Although the cilia membrane is contiguous with the plasma membrane, its composition is distinct, and protein entry into the ciliary membrane domain is tightly regulated. Several key signaling proteins have been localized to this organelle, including channels such as transient receptor potential vanilloid 4; the cystic kidney disease–associated proteins polycystin-1 and -2; and receptors for somatostatin (SSTR-3), serotonin (HT-6), angiopoietin (Tie-1 and Tie-2), hedgehog (smoothened), and PDGF (PDGFRα) (32–36). Although the molecular mechanism that directs these proteins into the cilia is unknown, the current model predicts that they dock with the terminal plate and transition fibers and are loaded onto the transport machinery for delivery into the cilium. Several studies have identified cilia targeting domains. This has been done for polycystin-2 and the odorant responsive cyclic nucleotide-gated channel CNGB1b, both of which require a RVXP motif for cilia localization (37,38). However, analysis of several other cilia transmembrane proteins indicates that the RVXP motif is not a universal targeting address (34,37–40). The typical cilia axoneme that extends from the basal body consists of nine microtubule doublets. Most motile forms of cilia also contain a central pair of microtubules (9 + 2 axoneme) while primary immotile cilia lack the central pair (9 + 0 axoneme). The microtubule axoneme serves as a structure for assembly of associated protein complexes that regulate the asymmetric gliding of the central doublet microtubules to generate motility. A notable exception to this association between architecture and motility is the solitary cilium that is found on cells of the embryonic node (node cilia). The node is an organizing center that is required for establishing embryonic body axes during development, and loss of these node cilia results in randomized left–right body specification. In addition to the 9 + 0 and 9 + 2 microtubule-based architecture in the axoneme, an elaborate structure can be seen by electron microscopy at the tip of many cilia (Figure 1C) (41). Although the importance of this machine remains unknown, the finding that cilia length is controlled by the addition or removal of tubulin at the cilia tip and that several proteins involved in transcriptional responses concentrate in this region suggest a role in regulating cilia signaling activity (15,20). This may have implications in cystic kidney disease pathogenesis because excessively long cilia or the absence of cilia has been associated with cyst development (42–45). In the kidney, primary cilia extend off the apical surface of the epithelium into the tubule lumen and are present on most cells of the nephron (Figure 1B). These cilia were thought to be of minimal importance for renal development. However, several studies in model organisms, some of which paradoxically lack kidneys, led to an increase in clinical and basic research directed at understanding the function of the renal cilium (reviewed in references [2,6,7]). In one of these studies, Barr and Sternberg (46) revealed that the homologs of polycystin-1 and -2, which are involved in the dominant forms of PKD (ADPKD) in humans, localize to cilia of sensory neurons of C. elegans. This has also been shown for the human and mouse homologs (35,47). Loss of the polycystins in C. elegans did not disrupt cilia formation but rather altered behavioral responses that require cilia function. At approximately the same time, several groups that were working in Chlamydomonas, C. elegans, and mice uncovered that the cystic renal pathology in the Oak Ridge Polycystic Kidney mouse (Tg737orpk) was due to mutations in a protein called IFT88 (also known as Tg737, polaris, or OSM-5) (423–44,48). This protein is required for cilia formation and functions as a component of the IFT particle. The importance of cilia for normal renal function and in cystogenesis was further supported by disrupting KIF3a (IFT-associated kinesin motor) specifically in the mouse kidney and by antisense morpholino oligonucleotide–mediated knockdown of IFT gene expression in Zebrafish (49,50). Although these studies suggest cilia are important for normal maintenance of renal physiology, the role of the primary cilium and its relationship to the mechanism of cyst formation remains poorly defined. Several studies have begun to address this issue. Praetorius and Spring (51,52) demonstrated that renal epithelium responds to fluid flow–mediated deflection of the cilia axoneme by increasing intracellular Ca2+. This calcium signal is distinct from mechanical stress that is sensed by the plasma membrane because removal of the cilium abolished the flow response. Furthermore, Nauli et al. (53) revealed that this flow response required the function of the polycystins, which localize in the cilium. Similar defects were reported by Liu et al. (54) in perfused tubules that were isolated from Tg737orpk mutants. Although calcium is a widely known second messenger, the downstream effects of this signal and the importance for cyst development are unknown. In addition to functioning as a mechanosensor, deflection of the cilia axoneme and the polycystins has effects on gene expression (55,56). In the presence of normal flow conditions, polycystin-1 remains in the cilia in association with STAT6 and p100. However, under nonflow conditions, the C-terminal tail of polycystin-1 is proteolytically cleaved and translocates to the nucleus with STAT6 to activate the AP-1 pathway (55). As with the calcium response, the downstream targets of this translocation event that are important in cyst development and renal cell function are unknown. Another role of cilia and polycystin-1 was proposed by Shillingford et al. (57). Their studies found that polycystin-1 functions to regulate activity of mammalian target of rapamycin (mTOR), a protein with essential roles in protein translation, cell growth, and proliferation (58). In cystic epithelium, mTOR activity was markedly elevated. Furthermore, treatment of rodent PKD models with rapamycin, an inhibitor of mTOR, attenuated the renal cystic pathology. According to this model, the disruption of cilia or mutations in polycystin-1 result in loss of a polycystin-1/mTOR inhibitory complex in the cilium, which in turn leads to increased proliferation and cyst development. Another model that involves cilia and PKD was proposed by Fischer et al. (59). In these studies, they demonstrated that defects in fibrocystin, a ciliary protein that is disrupted in human ARPKD, was associated with alteration in the orientation of the mitotic spindle relative to the axis of the tubule. During normal tubule growth, the mitotic spindle of dividing cells aligns with the axis of the nephron; however, in cells with mutations in Pkhd1 (encodes fibrocystin) as well as Hnf-1β, the spindle fails to orient correctly. This altered orientation of cellular division results in expansion of the tubule diameter (i.e., cyst formation) rather than increased nephron length. The role that cilia may play in regulating mitotic spindle orientation has not been fully explored. Multiple proteins whose functions are disrupted in non-PKD (not affecting polycystin-1, polycystin-2, or fibrocystin) forms of renal cystic diseases have also been reported in the cilium or at the basal body at the base of the cilium (reviewed in references [60,61]). The function of these proteins with regard to cyst development is still being determined, but, in general, mutations in these proteins do not seem to have major effects on cilia morphology. Included in this class are several of the proteins that are involved in BBS, Meckel syndrome, and NPHP. BBS is a rare, genetically heterogeneous group of disorders with a combination of pathologies, including obesity, retinal dystrophy, polydactyly, mental retardation, and cysts in the kidney (BBS [MIM 209900]). Twelve genes (BBS1 through 12) that are involved in BBS have been identified, and, in many cases, the corresponding proteins have been localized to the cilia axoneme or basal body (61–63). In most cases, the function of the BBS proteins remains elusive; however, analyses of BBS-7 and BBS-8 in C. elegans revealed they have a role in regulating IFT movement along the cilia axoneme (64). NPHP is also a heterogeneous group of diseases that result from mutations in six or more genes (nphp1 through 6) (65–67). Collectively, the NPHP proteins are referred to as nephrocystins, and data in mammalian systems suggest that they function as part of a complex. Recently, these proteins were localized to the cilium or the basal body (68,69). In the case of NPHP-1, this localization depends on its ability to interact with the phosphofurin acidic cluster sorting protein-1, which is regulated by the phosphorylation of NPHP1 by casein kinase 2 (70). The function of the NPHP proteins is uncertain, but data suggest that they are involved in the formation of signaling complexes. In the cases of NPHP-2 (inversin), one function is regulating the choice between noncanonical (β-catenin independent) and canonical (β-catenin dependent) Wnt signaling. In the kidney, canonical Wnt signaling prevails in the developing nephron, whereas noncanonical signaling is more important for tubular structure maintenance (71–73). NPHP-2 (inversin) localizes to the cilia/basal body and seems to function as a molecular switch to downregulate canonical Wnt signaling (74). Because ectopic activation of β-catenin is known to cause cyst formation, it is possible that dysfunction of NPHP-2 would lead to persistent activation of the canonical pathway and thus β-catenin–induced cystogenesis (75). Additional insight into the role of the NPHP proteins has been derived from simpler model organisms; nphp-1 and nphp-4 homologs have been identified in C. elegans. It is interesting that mutations in these genes in C. elegans did not disrupt cilia formation but did cause behavioral defects that are typical of those that are seen in mutants that lack cilia-mediated signaling activity (67,69). As for the mammalian proteins, the C. elegans NPHP proteins function as part of a complex as evidence by the fact that disruption of NPHP-4 causes the delocalization of NPHP-1 from the base of the cilium (69). In addition to renal cysts, humans and mouse models of PKD exhibit pathologies in tissues other than the kidney (60,76–78). In human PKD, the most commonly affected tissues are the liver and the pancreas, along with vascular abnormalities that involve brain aneurysms. Whether these pathologies are caused by cilia-mediated signaling defects remains to be fully explored; however, this seems likely in light of the systemic nature of the disease seen in the Tg737orpk hypomorphic mutant (6,79). The partial loss of IFT and cilia function in these mice results in cyst formation in the liver along with bile duct hyperplasia and severe pancreatic defects (80,81). Although the function of the primary cilium in bile ducts and its relationship to pathologies in PKD is not understood, recent studies by Masyuk et al. (82) demonstrated that the polycystins localize to the primary cilium of cholangiocytes and that the cilium functions as a mechanosensor, as observed in the kidney. They further showed, using microperfused intrahepatic bile ducts, that luminal flow increased intracellular calcium and also repressed cAMP levels. The decrease in cAMP is mediated through calcium inhibition of adenylyl cyclase 6, which is also present in the cilium. These findings are intriguing because intracellular cAMP levels are markedly elevated in cystic renal epithelium in human PKD as well as in mouse models, in which cilia or polycystin function is abrogated (83–86). Furthermore, in contrast to normal renal cells, cAMP acts as a mitogen in PKD epithelium, which can be inhibited by calcium. In addition, reduction of cAMP levels in cystic kidney disease mouse models using vasopressin receptor 2 antagonists greatly retards cyst formation or progression (83,86). Together, these findings provide insights into the mechanism behind the proliferative phenotype in PKD renal epithelium, where loss of the flow-induced calcium signal and subsequent increase in cAMP lead to the proliferative response to cAMP (87,88). Although not a feature of human PKD, defects in the polycystins in mice also result in developmental abnormalities. Most notable are the random specification of the left–right body axis (situs inversus or heterotaxia) in mice with mutations in pkd-2 and skeletal defects in pkd-1 mutants (89,90). These phenotypes are also observed in the IFT mutants such as the Tg737 null mice (91). One of the current models suggests that polycystin-2, located in the cilia axoneme, is required to sense fluid movement over the surface of the embryonic node, similar to that proposed in the kidney (90,92). This is thought to cause an asymmetric calcium signal that establishes the left and right body axis. However, it should be noted that several other models have been put forth to explain the role of cilia in establishing the body axis and that true mechanisms have not yet been firmly established (93,94). Research conducted during the past decade has led to the discovery that defects in proteins that localize to cilia or the basal body are primary contributors to renal cyst development. Furthermore, these studies have uncovered a role for the primary cilium as a mechanosensor in a number of tissues and are providing important insights into the molecular and cellular mechanism that lead to cystogenesis. Primary cilia on tubule epithelia are ideally positioned to receive extracellular stimuli and for transduction of these signals into the cell to elicit responses. The cilium extends into the lumen of tubules away from the cell's immediate surface to evaluate changes in the cell's environment. The cilium also has a relatively large membrane-to-cytosol ratio that facilitates close association among receptors, channels, and the downstream signaling machinery in addition to permitting rapid changes in second messenger concentrations. Finally, current data suggest that protein entry into the cilium is under regulatory control, making this organelle a specialized domain for controlling sensory responses. More recent data have suggested an alterative role for an IFT protein that is distinct from that in cilia formation. These new findings suggest that the IFT proteins may be directly involved in regulating cell-cycle progression. Such a role for the IFT proteins could help to explain the proliferative phenotype that is associated with cystic kidney disorders. Activities were supported by National Institutes of Health grant RO1 DK65655 (B.K.Y.). I regret that space limitations prevent me from acknowledging the research by many of those who have contributed to the data that led to the recent renaissance of the cilium. I thank M. Winkelbauer and Drs. Haycraft and Guay-Woodford for critical comments and advice on this review.